In the field of working at heights however, the law lays out the equipment and systems to match. You can only move to a lower level where it is “not practicable” to use a higher order control. This first level aims to eliminate the hazard. The Code of Practice suggests a host of measures, from using extendable handles on paint rollers to tilt-slab concrete wall construction, as alternatives to working at height. “Passive fall protection device” includes height safety products that once installed, don’t need to be altered. Examples: fixed or mobile scaffolds, guardrails, scissor lifts, cherry pickers and roof safety mesh. These typically include industrial rope access systems and travel restraint systems. They prevent workers falling over an unprotected edge and are normally harnesses attached by lanyards to roof anchors or static lines, or harnesses with ropes and friction devices. Because their effectiveness depends entirely on the skills of their users and how well the equipment is maintained, both users and their supervisors should undertake competency-based training before implementing level 3 safeguards. 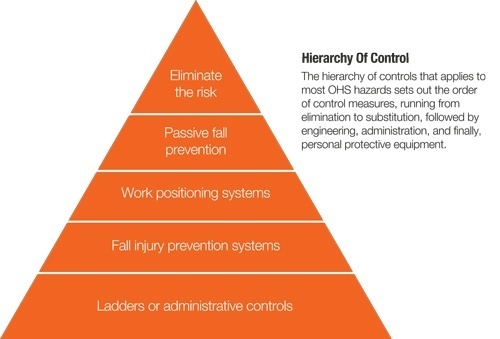 Often confused with work positioning systems, fall injury prevention systems are fundamentally different. While work positioning systems prevent the fall from occurring at all, level 4 controls merely minimise the distance of the fall. Examples include safety nets, catch platforms and individual fall arrest systems (IFAS). All must be installed by people with specialist technical skills and workers using IFAS must also be highly trained. The Code of Practice notes that “An IFAS requires considerable skill to use safely, and in the event of an arrested fall, it is likely to cause some physical injury to the user”. Workers using IFAS should never work alone and an emergency plan needs to be put in place to allow a speedy rescue. The last resort for working safely at height encompasses ladders and procedures, or “administrative controls”. The reason these two are grouped together at the end of the risk control sequence is that they are equally poor ways to control the risk of a fall. The Code details the correct use of ladders and outlines the need for stringent documentation of administrative controls. Aside from meeting your obligations, it is good business to install the higher level controls like guardrails and walkways wherever possible rather than relying on fall prevention and fall arrest systems. Simple, low maintenance systems like guardrails are less costly over their lifetimes, require little training to use and allow a broader spectrum of workers to do the job safely.